Pond near the DYK substation in the Doi Chiang Dao national park – a regular site for Black-tailed Crake. Now in northern Thailand, but it’s been a mostly quiet week for birding, and a busy one for eating and drinking in Chiang Mai. My dad and I rented a car for a couple of days, driving the Samoeng loop where a notable sighting was Red-billed Blue Magpie. 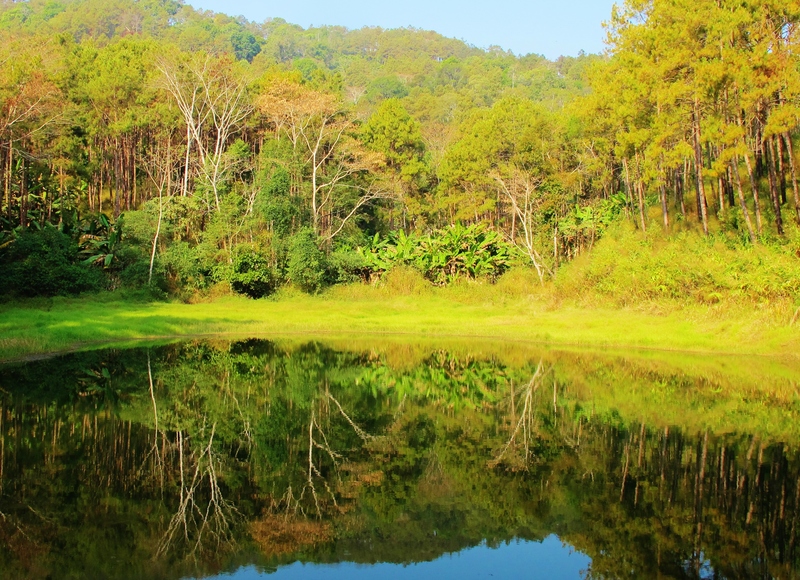 A lunch stop in Chiang Dao produced just a few common species for the year list. 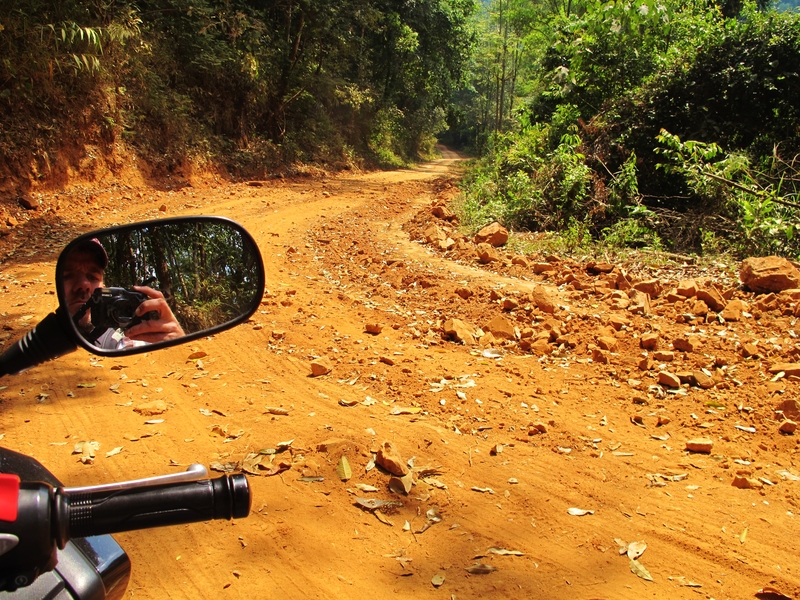 Dad flew back to England yesterday, so I hopped on a rented motorcycle and returned to Chiang Dao. As usual I’m staying at the tranquil Malee’s Nature Lovers Bungalows, an ideal base for birding excursions in the area (and usually one or two other birders are in residence, too). A late afternoon visit to the temple and gully was excellent, with the highlight a Rusty-naped Pitta, glimpsed briefly very close to the entrance of the gully trail. Naturally, it hopped away into thick cover and could not be refound. This is a regular spot for this sought-after species, but the first time I have seen it here (my only previous sighting in the area was on the summit trail). Other highlights included two Asian Stubtails, and a Streaked Wren-Babbler at the temple steps, as well as some of the expected local species for the year list. 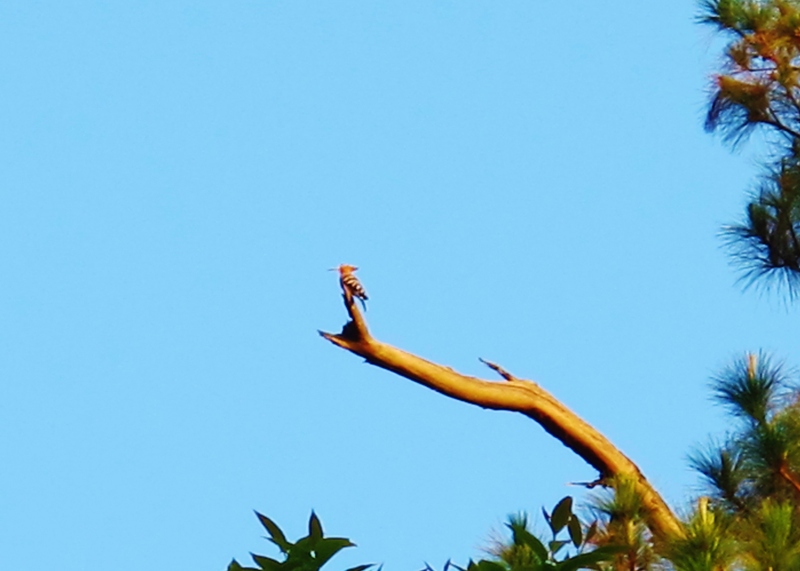 Ten points for spotting the Hoopoe …. The next morning, I made a very early start for the familiar ordeal that is the drive up to the DYK substation. It was all the harder today because of my highly unsuitable wheels – a 300cc Honda “maxi-scooter”. It’s a very large and heavy automatic scooter, completely unsuited to a 20km-long, sandy, rocky and steep dirt track. On the plus side, it did have plenty of power for the ascents! I abandoned my scooter before the steep switchbacks near DYK, and walked the remaining 2km to the substation on foot. Bird activity was high, and I saw a lot of the expected specialities of this mid-altitude, open forest. As it was getting light, on the drive up the mountain, several White-crowned Forktails were on the road. Further along the road to DYK, a Hoopoe showed well, with another two later near the substation. This is a regular bird here – the only site in Thailand I have seen this familiar European species. The best birds in the DYK area today were: a male Daurian Redstart (a very scarce bird in Thailand), a female Chestnut-bellied Rock Thrush, a single Giant Nuthatch (one of the two top specialities of this site), a Scaly Thrush, two Grey-headed Parrotbills, both Rusty-cheeked and White-browed Scimitar-Babblers seen well, an Indochinese Cuckooshrike, both Maroon and Slender-billed Orioles, Stripe-breasted Woodpecker, and a small flock of Chestnut Buntings. It was a little disappointing not to get a lifer – such birds as White-bellied Redstart, Slaty-backed Flycatcher and Black-tailed Crake are all possible here and regularly seen. I also missed Hume’s Pheasant, probably the top target for most birders at this site, but I’ve seen them several times in the past here so it wasn’t too crucial to connect with this one today. With 42 birds added in the Chiang Dao area so far, my year list is currently at 312 species. The road up to the DYK substation – definitely not suitable for maxi-scooters!